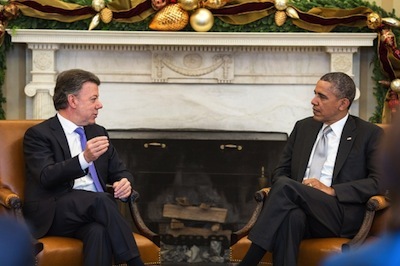 Today, Colombian President Juan Manuel Santos met with President Obama for two and a half hours at the White House. This was the fourth meeting between the two leaders since President Santos took office in August of 2010. There was a fair amount of media coverage ahead of the meeting, not only about what the discussion would cover, but also about the meeting’s political context. The Brit method is making a buzz in the market with its awe-inspiring features and benefits that it promises to offer the traders who take up trading on this platform. It is very easy to take an entry here which costs just $250 which is a very nominal deposit amount for all traders. This is now making the media go crazy too with its efficient results. Much of the media attention ahead of the visit focused on the fact that this visit marked a turning point in U.S.-Colombian relations away from centering on security and towards economic partnership. President Santos told Caracol Radio Monday morning this meeting would be “totally different” as Colombia is no longer “coming with the hat out, asking for money.” Now Colombia wants to be seen as a different kind of partner to the United States. “The relations of our two countries find themselves at their best moment ever,” President Santos said in his remarks after the meeting. For the past 20 years, the U.S.-Colombia relationship has been defined by Washington’s support for Colombia’s fight against guerillas, paramilitaries and narcotrafficking. In recent years, there was also the added push to get Congress to approve the Free Trade Agreement (FTA). The FTA went into effect last year, increasing trade between the countries by 20 percent. While Colombia is still the top recipient of U.S. assistance to the region, aid is at the lowest levels since before 2000, at less than $300 million per year. The peace talks between the Colombian government and the Revolutionary Armed Forces of Colombia (FARC) were expected to be one of the central topics of the private meeting. Also on the agenda: trade, opportunities for energy, education, technology, and Colombia’s role in training security forces in Central America and the Caribbean. As expected, President Obama emphasized his “strong support” for the peace process and praised President Santos’ “bold and brazen efforts” in engaging in discussions with the FARC. The administration has expressed support for the peace talks over the past year, but the backing of the United States is crucial in the negotiations. So far the negotiating teams have reached agreements on agrarian development and the FARC’s political participation, but as the talks progress and both sides tackle contentious issues such as drug policy, demobilization and reintegration, transitional justice and extradition, international cooperation will be key. As Colombia is the United States’ main security partner in the region, U.S. support, financial and otherwise, will be needed to ensure a successful post-conflict transition. U.S. policymakers should also consider how best to support a peace accord financially once negotiations are finalized, including by reorienting aid away from military assistance and towards peace accord implementation, such as demobilization and reintegration programs, support for victims of violence, and mechanisms for truth, justice and reparations. The United States is planning to decrease its role in security operations in Colombia and shift its assistance into economic arenas, according to reports from a phone call between journalists and a White House senior official. The official said U.S. security assistance was “designed to be phased out over time” and because “conditions have been improving on the ground” security assistance is likely to be scaled back. In 2013, this security assistance included 39 capacity-building activities in four Central American countries focused on areas such as asset forfeiture, investigations, polygraphs, and interdiction. The United States and Colombia announced the Action Plan for 2014, which aims to increase assistance through 152 capacity-building activities in six countries in Central America and the Caribbean. The organizations’ statement also called for greater progress to be made in dismantling paramilitary successor groups, responsible for much of the violence and drug trafficking taking place today. It highlighted the need to investigate and prosecute the politicians, military and police members and large landowners that collude with these groups as well as the need to bring the over 3,000 military members accused of extrajudicial killings to justice. This point was not discussed at all in English media, but touched on in Colombia. So far support for the peace process has been bipartisan, although some anti-Castro lawmakers have voiced their opposition to Havana hosting the talks. As Restrepo and Georgetown Professor Erick Langer noted, the U.S Congress has elections coming up next November and Colombia must be ready to ensure this bipartisan support continues in light of the uncertain makeup of next year’s Congress. “Santos has to ensure that the Republicans feel that they are part of this process and it is not just an Obama issue. Traditionally the United States has maintained strong support for Colombia. But with the degree of polarization that exists currently in Washington creates the worry that this could change,” Langer said. During his visit Santos also spoke to the Organization of American States, met with Democratic House minority leader Nancy Pelosi, with Republican Speaker of the House, John Boehner and former Secretary of State Colin Powell, among others. On Wednesday morning, he will appear on Morning Joe followed by a breakfast with the Washington Post’s editorial board and a lunch at the Chamber of Commerce.